Tamara Ralph seems to have extended the creative mind set she was in for her Spring 2015 Couture Collection and expanded on those notions while conforming to the heavier mood, weights and colors of winter fashion. The Ralph & Russo Haute Couture Fall 2015-16 Collection offers a bevy of shapes to suit a variety of client’s tastes and potential events. These are not styles simply for a gala. These are designs for a memorable entrance, center stage. There are dramatic ballroom styles and flowing palatial capes. Other designs are more sensual, focus on a silhouette and feature assets provocatively; a cinched waist, bared to the waist V-neckline or leg bearing slits. Fabrics are folded, pleated, layered and manipulated artistry and are ultimately luxurious. Designs are flowing, refined and elegant and often embellished in rich and elaborate beaded embroidery and jeweled appliques. In fact the piece de resistance is an absolutely breathtaking, form fitting wedding gown & to the floor veil that is in integral part of the overall design. The dress begins with a Victorian neckline, follows the form, then flows into a long and quite dramatic train. It is dripping in the most elaborate beaded embroidery and exquisite lace and makes an unforgettable impression! You really should see it in the live show at the end of the post. 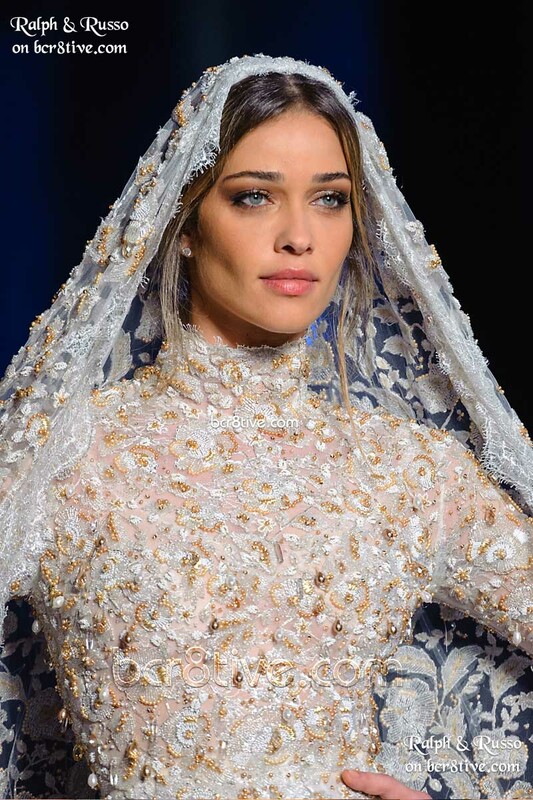 Ana Beatriz Barros features it like it was made for her. It’s utterly gorgeous!